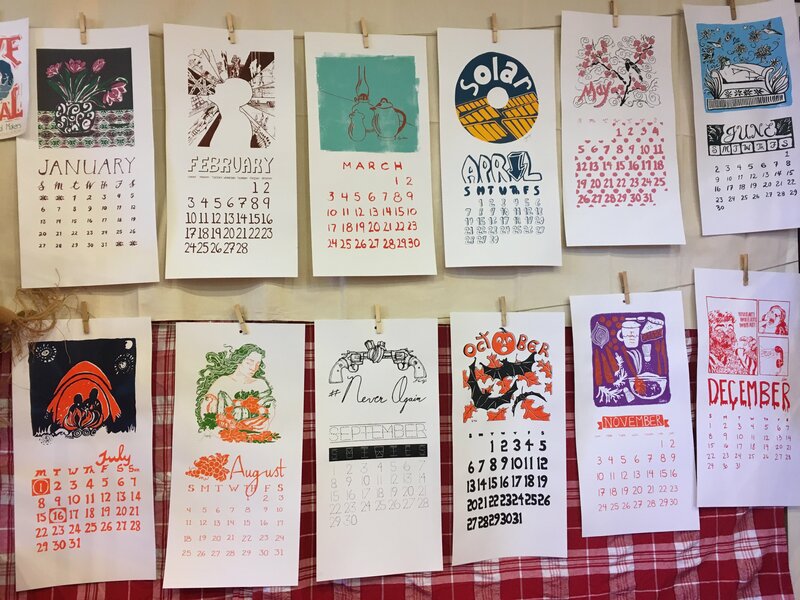 Wickham Works has released its limited edition 2019 screen printed calendar this December. 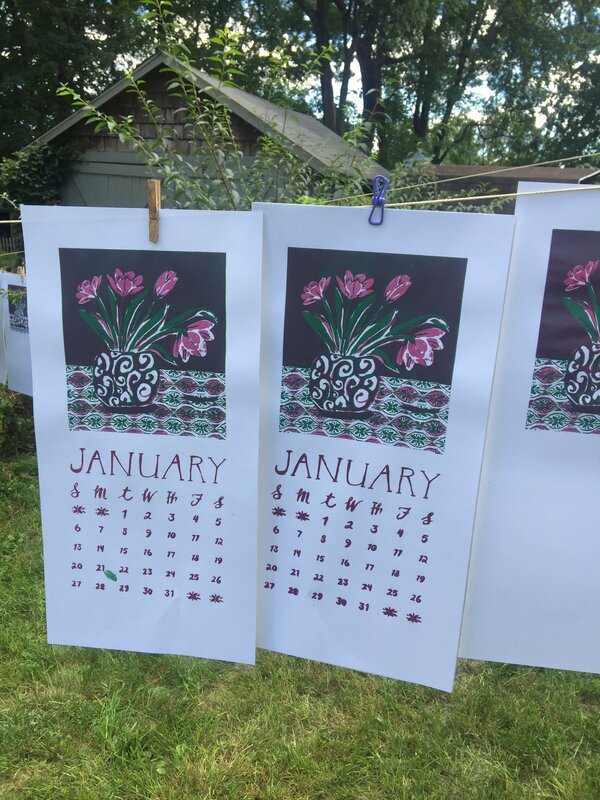 With a bit-o-knowledge about screen printing and a lot of forearm strength we set out to edition 125 copies of a 12-month calendar. You can buy a copy of the calendar here and support local making. 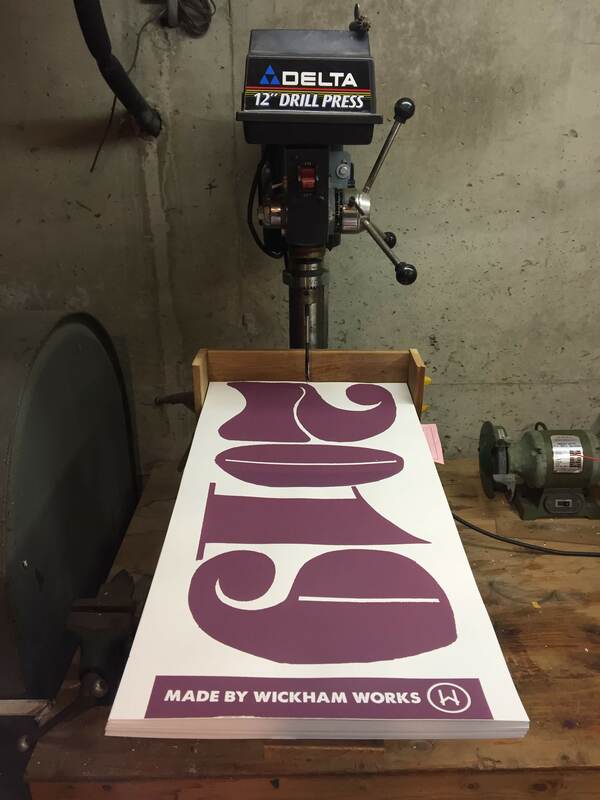 Wickham Works is a group of makers coalescing around the idea of building cultures, communities and jobs. We do this through organizing events by and for makers, artists, activists, and musicians. The calendar is the first physical thing we have made and sold as a group. 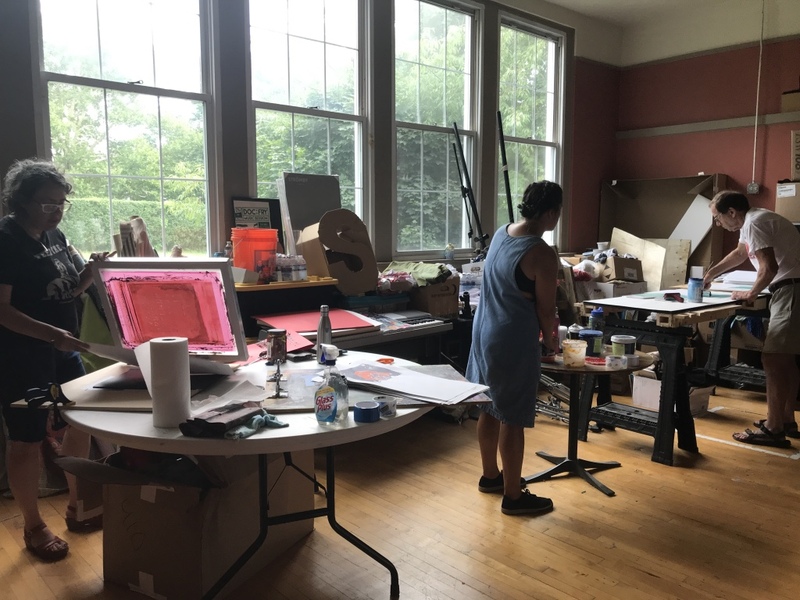 The money we raise will pay for new projects like a dark room and sink in our studio, lumber for work benches and shelving and more equipment for making things. Making a calendar purchase means that Wickham Works can keep making things happen. Each month is hand drawn and lettered by a local artist. The artwork was then digitized and screens were burned. The artists from January to December respectively are: Femi Ford (January), Gabriel Jasmin, Roger Moss, Jamie Munkatchy, Pat Foxx, Janet Fatta Howard, Melissa Shaw-Smith, Fern Hippely, Steven Vega, Gary Genetti, Rebecca Pry, and Dayna Christison. Here are images of each month. We burned 2-3 screens for each calendar month. 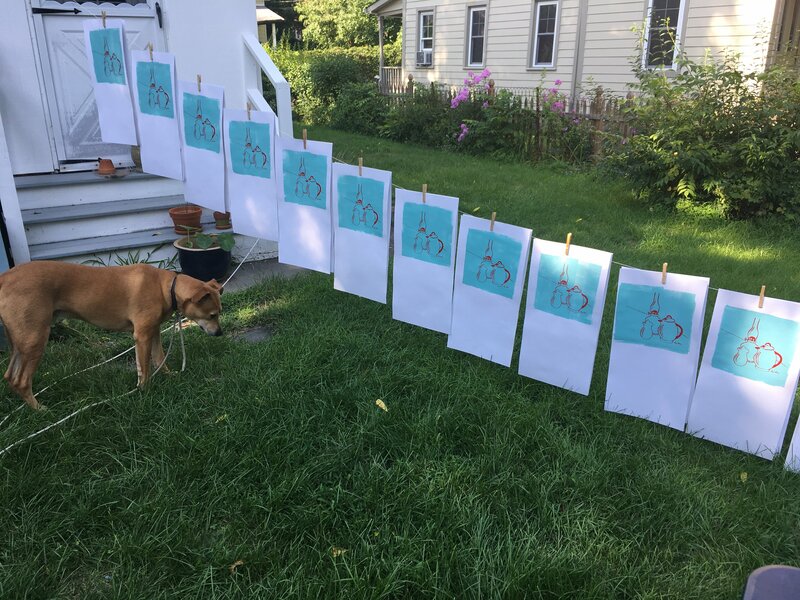 Multiple color prints required a screen for each color. We built 5 presses and gathered folks to print from August to November of 2018. 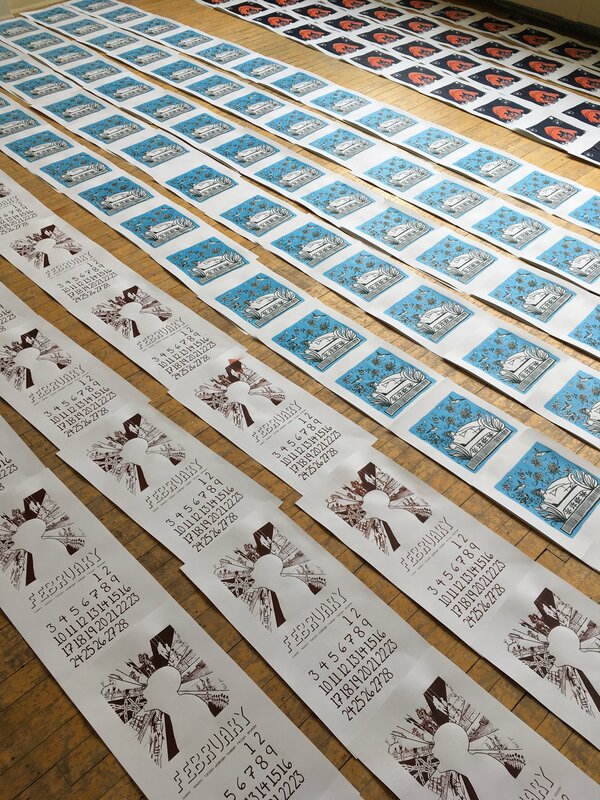 We printed on 100% post consumer waste paper from New York’s own Mohawk mill. Our screens and ink come from Victory Factory in Queens, New York. Rooster Tees in Warwick, New York burned our screens. We printed at the Warwick Valley Community Center, on Church Street, and Horizon Farms road. 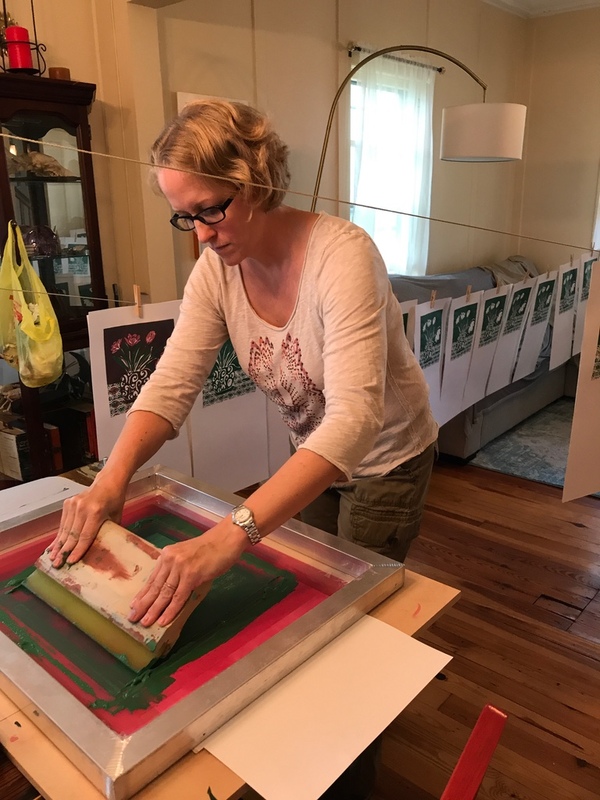 We printed in dining rooms, basements, art studios, backyards and dance studios. 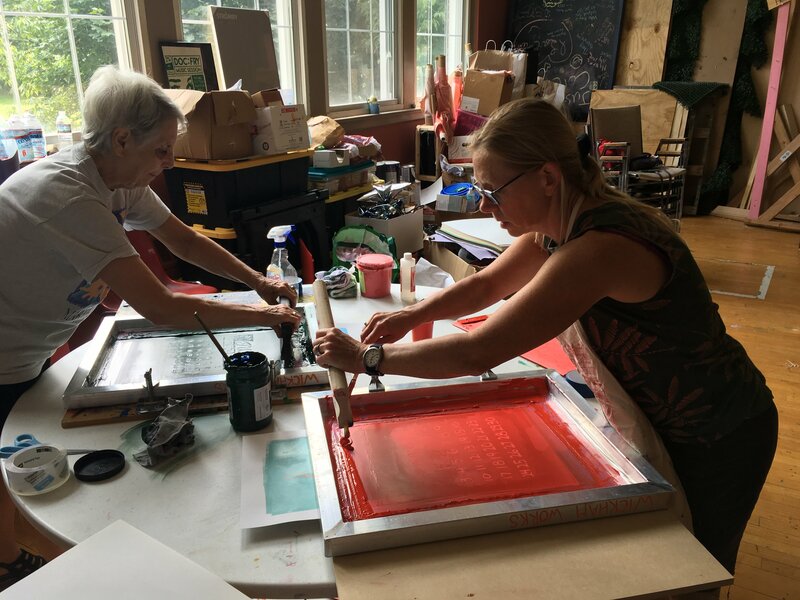 We taught ourselves 3 kinds of registration technique for multiple colors and experimented with inks and transparency medium. In the end we pulled the squeegee 4,250 times. And learned what drill bits can make holes in large stacks of paper. Here are images of the process. Click this link to purchase. If you are in and around Warwick, New York we will contact you and deliver the calendar to your doorstep. If you are not close enough, we will ship the calendar at no cost to you.